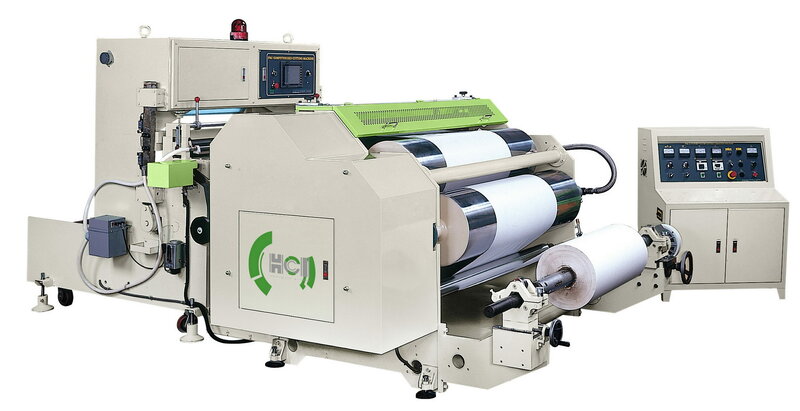 Rigid Film Flatten and Sheeting Machine(FSC-G) - HCI Converting Equipment Co., Ltd.
Lift-up type unwind stand with 3" air shaft. Single operator is required to manipulate and load the parent roll. Equipped with magnetic powder brake for tension control. The AC motor driven dancing roller unit for auto speed varied and assures that the most stable web feeding. Employs an automatic thermo-controlled heated oil circulation system; flatten films can be neatly flattened and smoothed. The heating roll employs a hot kerosene circulation for energy and cost saving performance. Numerically controlled stepping motor provides very accurate positioning and cutting, and reduces errors to a minimum. The cutter is hydraulically controlled without further adjustment for cutting thick and thin materials. Special alloy blade provides clean and long lasting cutting performance. The cutter is specially guarded for maximum operator safety. Touch screen setting for cutting length, speed and related parameters. Hydraulic ascent / descent unwinder.